*One of Greg's favorite trees! A chance seedling of the Washington Navel orange, the Trovita orange is smaller, juicier and sweeter than its parent and may have a few seeds. 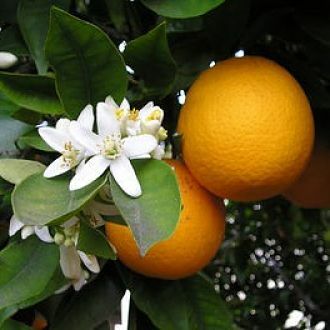 Trovita oranges ripen in the springtime, so having blossoms and fruit on the tree at the same time is not unusual. Trovita is one of the only oranges suitable for indoor culture since it will develop a sweet flavor without a lot of heat. The tree is vigorous, upright-growing, and productive, but may be prone to alternate bearing (the tendency of fruit trees to produce a heavy crop one year followed by a light crop or no crop the following year).